Stephen Bassett upset the pre-stage favorites on the queen stage of the Redlands Bicycle Classic today, timing a late attack on the decisive Oak Glen climb to perfection. 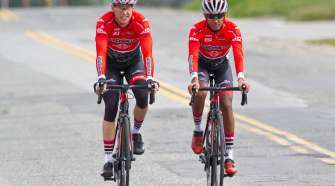 The First Internet Bank rider rode away from Edgar Frayre (Elevate – KHS) and yesterday’s stage winner Kevin Vermaerke (Hagens Berman Axeon) to win by a handful of seconds. With three kilometers to go, Bassett played the waiting game behind Vermaerke, whose performance moved him into the yellow jersey, and Frayre as the duo traded attacks into the wind. 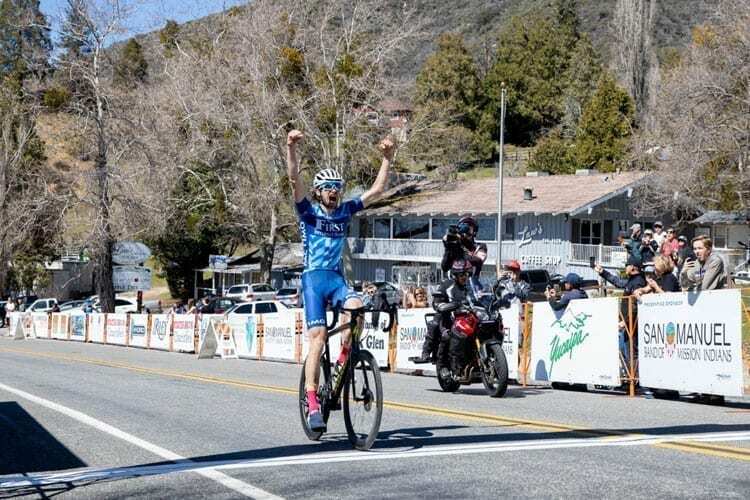 The 90-mile (144km) Yucaipa Road Race eventually drew out an 11-man break that included Michael Hernandez (Aevolo), Tony Baca (303 Project) and junior national champion Quinn Simmons (Landis Cyclery). 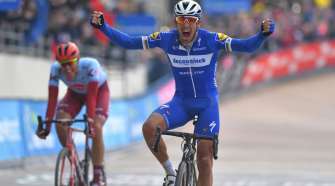 The breakaway gained a maximum of three minutes while Simmons scooped up enough points to move into the sprint jersey. Despite the relatively large lead, Hagens Berman Axeon controlled the peloton and eventually, brought them back right before the final climb. Simmons was the last rider from the original breakaway to be caught, succumbing to Axeon’s pressure with five kilometers to go. 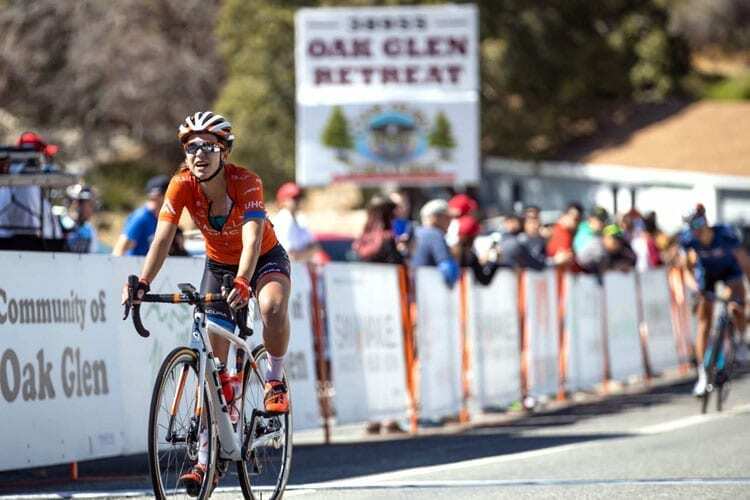 Krista Doebel-Hickok claimed Rally UHC’s second win of the week on stage 3 of Redlands Classic after a late surge in the closing meters of Oak Glen ascent. The 29-year-old climber saw her opportunity to accelerate with 500 meters to the line, putting 44 seconds into eventual second place, Emma Grant (Sho-Air Twenty20). Doebel-Hickok’s performance boosted her into the Queen of the Mountains jersey, which she holds by one point ahead of race leader, Amber Neben. After today’s stage, Neben held onto the yellow jersey and now sits 39 seconds ahead of Doebel-Hickok, who moved up to second place on GC. Emma Newsom (Tibco SVB) is third at 1:25. The 61-mile (98km) Yucaipa Road Race saw a six-rider breakaway establish after 25mi (40km). The group included Gillian Elsay and Abi Mickey (Rally), Allie Dragoo (ShoAir – Twenty20), Lily Williams and Jenn Valente (Supermint), and Emily Marcolini (Tibco SVB) who quickly drew out a gap of a minute and 30 seconds. It hovered in that range mid-race, with Williams intent on scooping intermediate sprint points towards the green jersey, which she’ll wear tomorrow. In the latter part of the stage, with Oak Glen climb looming, the peloton began to draw the breakaway back, and Anna Dorovskikh (Amy D) saw an opportunity to bridge across to the six. Dorovskikh’s efforts lifted her into the white amateur jersey and 19th place on GC. With the breakaway caught at the base of the climb, it was a free for all to the finish line, and only Emma Grant (Sho-Air) could stay on Doebel-Hickok’s wheel as the gradient rose. 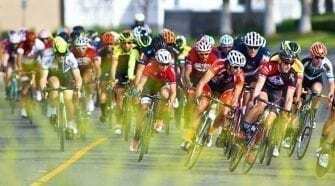 Stage 4 and 5 will be streamed live free of charge at cyclestream.tv, with a link available on the Redlands Classic website. Coverage begins Saturday at 1 p.m. PST. Streaming sponsored by Wildlife Generation and Cycle Stream TV. Cycling announcers Brad Sohner and Dave Towle will provide commentary.